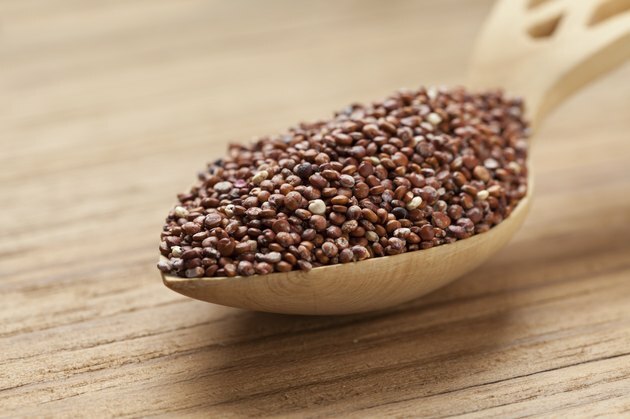 Red quinoa, originally a staple of the Incas, has the highest protein content of all grains. Quinoa has a delicate flavor, crunchy texture and comes in many varieties including white, black and red. Red quinoa is also rich in essential minerals and vitamins and is gluten-free. According to the USDA National Nutrient Database, which provides a full nutrient profile, 1 cup of cooked red quinoa has 222 calories. Enjoy red quinoa in salads, soups or as a light, fluffy side dish. Red quinoa, and all varieties of quinoa, contains complete protein, meaning it has all nine essential amino acids in the correct proportions. You need a supply of amino acids from protein in your diet to support the growth and repair of tissues and organs. One cup of cooked red quinoa has 8.14 grams of protein. The amount of protein recommended daily by the Institute of Medicine is 46 grams for women and 56 grams for men. A diet high in fiber promotes heart and digestive health and controls blood glucose and insulin concentrations. A 1-cup serving of cooked quinoa provides 5.2 grams of dietary fiber. The Institute of Medicine recommends men consume 38 grams of fiber daily and women consume 25 grams. Folate, also known as vitamin B9, is a water-soluble vitamin essential for maintenance and production of new cells and for DNA and RNA synthesis. One cup of red quinoa provides 78 micrograms of folate. According to the Institute of Medicine, adults need 400 micrograms of folate daily. Adequate folate intake among women of childbearing age reduces the risk of birth defects. You need iron in your diet for the production of new red blood cells and for certain enzymes involved in energy metabolism. A 1-cup serving of cooked red quinoa provides 2.76 milligrams of iron. The Institute of Medicine recommends 8 milligrams of iron daily for men and 18 milligrams for women. The type of iron found in plant foods such as quinoa is better absorbed when consumed with foods high in vitamin C such as broccoli or tomatoes. Zinc is necessary for the function for almost 100 enzymes and plays a structural role in cell membranes. One cup of cooked red quinoa provides 2.02 milligrams of zinc. The amount of daily zinc recommended by the Institute of Medicine is 8 milligrams for women and 11 milligrams for men. Zinc is also essential for proper immune system function. Can You Eat Quinoa Raw or Uncooked?